Toronto, June 18, 2014 – Visual artist and author Christi Belcourt is the 2014 recipient of the Ontario Arts Council Aboriginal Arts Award. Created in 2012, this award celebrates the work of Aboriginal artists and arts leaders who have made significant contributions to the arts in Ontario. The $10,000 prize will be presented at the Art Gallery of Ontario (AGO) exhibition Before and after the Horizon: Anishinaabe Artists of the Great Lakes on Wednesday, July 30 at 6:30 p.m. 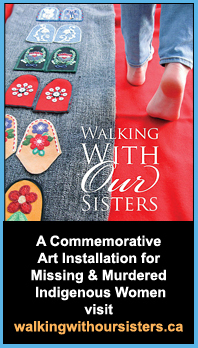 The event will also include the unveiling of a new work commissioned from Belcourt by the AGO. The public is welcome to attend the event, during which admission to the AGO will be free. Christi is a Métis artist based in Espanola, Ontario. Her work explores a variety of issues, including concerns for the environment, biodiversity, spirituality and Indigenous rights. Her work can be found in the permanent collections of the National Gallery of Canada, the Gabriel Dumont Institute, and the Nature Conservancy of Canada, among other leading institutions. The OAC Aboriginal Arts Award also honours the next generation of artists: each year, the award recipient is invited to nominate an emerging Aboriginal artist to receive a $2,500 prize. Belcourt has selected visual artist and dancer Jaime Koebel as this year’s Emerging Aboriginal artist. Jaime Koebel is an Otipemisiwak (Métis) and Nehiyaw (Cree) artist and Indigenous arts animator originally from Lac La Biche, Alberta, and now living in Ottawa. Jaime’s traditional and contemporary art practices include Métis beadwork, drawings, ink on drums, and fish scale art. She leads visual arts workshops, classes and demonstrations. Jaime and her three children perform as Jaime & the Jiglets, a Métis dance group that entertains and teaches through stories and audience interaction. The Ontario Arts Council Aboriginal Arts Award is a $12,500 award program: $10,000 is awarded to the laureate, $2,500 to the emerging artist. The laureate and emerging artist are announced in June each year to mark National Aboriginal History Month. Jurors for the 2014 award were Danis Goulet (Cree/Métis, Toronto), Cheri Maracle (Mohawk, Six Nations of the Grand River) and Travis Shilling (Ojibwe, Rama First Nation). Any Ontarian, Aboriginal or non-Aboriginal, can nominate an Aboriginal artist or Aboriginal arts leader for this award. Nomination forms for the 2015 award will be available on October 1, 2014. Learn about the 2013 laureate, Basil Johnston, and the 2012 laureate, Shelley Niro.